It has been confirmed that the Detective Branch of the Bangladesh Police detained three bloggers — Rasel Parvez, Mashiur Rahman Biplob and Subrata Adhikari Shuvo — on the evening of Monday, April 1 for their alleged write-ups demeaning Islam and the Prophet Muhammad. They were initially summoned to the police station and later taken to their homes where their laptops, mobile phones and other devices were confiscated. They were then moved to an unknown location. This comes after the government took steps against bloggers and Facebook users who made derogatory remarks about Islam and the Prophet Muhammad. On March 31, representatives of hardliner Muslim clerics submitted a list of 84 bloggers [bn] to a committee formed by the Home Ministry, accusing the bloggers of atheism and writing against Islam. It is important to acknowledge that Bangladesh is a non-religious parliamentary democracy, so there is no sharia law or blasphemy law. If a person claims to be an atheist, he or she has the same rights as other citizens. However, Under Section 295A of Bangladesh's Penal Code (1860), any person who has a “deliberate” or “malicious” intention of “hurting religious sentiments” can be subject to imprisonment. Intellectual, physicist, blogger, and writer Rasel Parvez has two primary blogs, one hosted in Somewherein.net platform, and another in Amarblog.com. However, accusations against him concern content published on another blog, under the pseudonym Opobak. Mashiur Rahman Biplob blogs under the pseudonym Allama Shoytaan (Mullah Devil) on various sites including Somewherein.net. Subrata Adhikari Shuvo writes for Amarblog.com using his own name. Accusations against him concern content published under the nickname Lalu Koshai. It remains to be seen whether the authorities will be able to prove that these bloggers had any “deliberate” or “malicious” intention of “hurting religious sentiments” with their writings. The Detective Branch will have a press briefing at noon on April 2 (Bangladesh time). Amarblog demands unconditional release of all detained bloggers and hopes that harassment against bloggers and Amarblog platform, which is vocal against anti-liberation propaganda, will be stopped immediately. 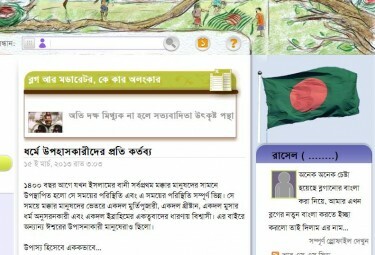 We also want to know from the Bangladesh government whether Amarblog.com is being blocked in Bangladesh and for what reason? The arrest came amid strong criticism over the government role, which many termed as “submissive”, following some radical Islamist organisations’ threat of unleashing anarchy if “atheist bloggers are not hanged”. MK Alamgir, the Home Minister of Bangladesh informed that the Ministry has identified 11 bloggers “who have hurt religious sentiment of Muslims through their writings”. Four of them have already been arrested and hunt is on for seven more bloggers. Hefajat-e Islam, a so-called Islamist organisation campaigning against the Shahbag movement initiated by the bloggers, will march towards Dhaka on April 6 and have threatened of non-stop shutdown and letting loose 313 members of suicide squad if the government obstructs its march.